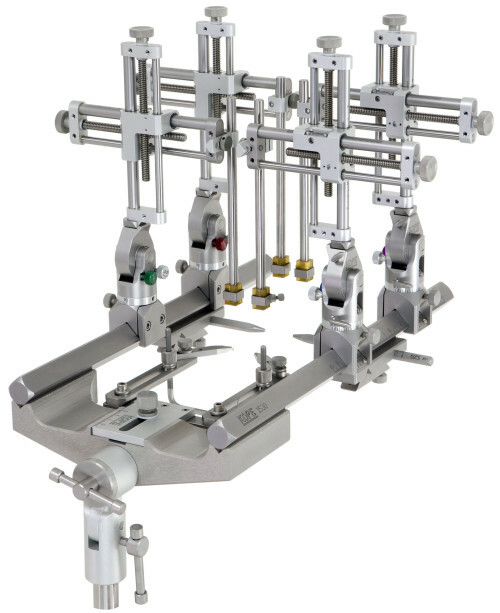 Model 1504 Stereotaxic Instrument is a rigid, heavy duty unit that enables precise alignment of laboratory animals for stereotaxic surgery. Modular in design it can be used with a wide variety of adaptors. Animals from the size of a beagle dog down to and including mice, can be placed with the same ease and precision. This is our most versatile stereotaxic instrument. Model 1504 consists of a Kopf Model 1530 Frame Assembly and four Model 1460 three-dimensional electrode manipulators. Model 1770 Electrode Holder with corner clamp is included. Manipulator resolution includes 100 microns (0.1 mm) all axis. Manipulator product specifications and options are located here. Model 1530 Frame Assembly includes one set of double ear bar locators, Model 1210 Table Mount Base Plate (4¾” x 3¾”) and Model 1225 Universal Swivel Stand which allows dual plane rotation. Model 1535 Dog / Monkey Adaptor locates the animal firmly and accurately by means of tapered ear bars which fit into the external auditory meatus. Adjustable infra-orbital clamps and a vertically adjustable tooth bar prevent rotation of the skull. Adaptor is suitable for use with Beagles, mongrels of Beagle size and Macaque monkeys. The second set of ear bar locators are for use with shorter adaptors such as the cat, monkey, rabbit and rat. Model 1530-B Stereotaxic Frame Assembly includes: Stereotaxic “U” frame with one set of double ear bar locators. Model 1460 Electrode Manipulator (Qty. 4) including Model 1770 Standard Electrode Holder with corner clamp. Frame bars are extra long and manipulators can be mounted from either end of A/P bar. Assures extreme rigidity without sacrificing flexibility.